Through the years we’ve had many music driven shows on television such as American Idol, The Voice, The Singoff and many more. 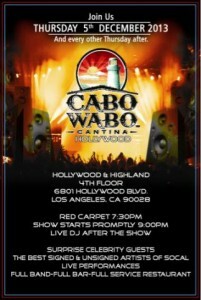 Well finally we have that music based platform in the heart of Hollywood called BLAZE THE MIC. BLAZE THE MIC was created by singers, song writers, producers Parrice Smith and Ja’ire Hattley, and businessman Dennis Rezaieh for up and coming artists both independent and major to sharpen their skills and connect with fans as well as showcase their talents for record executives and producers. “There are so many talented people out here but unfortunately there are not enough professional music platforms to expose them.” BLAZE THE MIC brings all different types of music together with the focus of making careers blossom. The night consists of a professional host full band complete with background singers for an amazing show and a DJ to set the mood for mixing and mingling with guests after the performances are over. 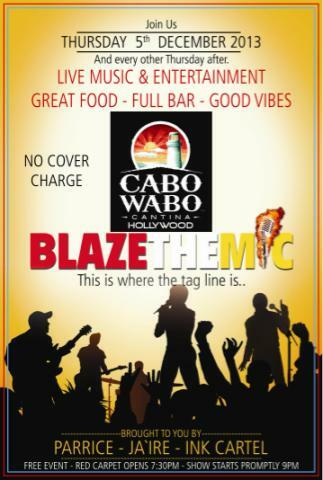 So when you want to sing, dance or just get out and enjoy yourself with live music,good food, and drinks BLAZE THE MIC is the place to be every other Thursday, starting December 5, 2013.